The NAXSA Training Committee released four training videos for your use. The videos are accessible on NAXSA’s YouTube channel. You are encouraged to Subscribe to the association’s YouTube Channel and Like the videos if you choose. 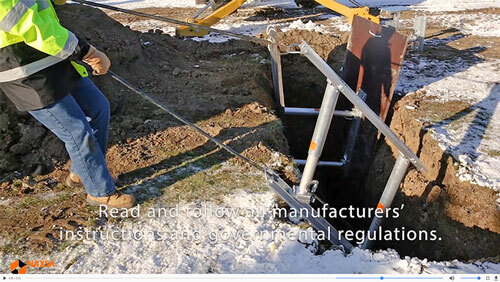 Presented by David V. Dow with NAXSA Member Underground Safety Equipment, this video details the proper procedure to install and remove hydraulic vertical shores, as well as when Finform may be required for use with hydraulic shores. Dow performs a ‘walk-around’ of a trench shield pointing out the various items that should be inspected before determining the shield safe for operation. James McRay with NAXSA member manufacturer Efficiency Production narrates the proper steps to safely assemble and disassemble a steel trench shield, as well as the safety precautions that must be observed. Dow details the important inspection process that should be performed on all hydraulic vertical shores and shoring fluid pump cans before any hydraulic shoring equipment is safely put into use. In addition to Dow and McRay, the Training Committee’s video working group included Ron Wey with NAXSA member manufacturer Pro-Tec Equipment. In the video How to Install and Remove Hydraulic Vertical Shores, NAXSA Training Committee Chairman, David V. Dow, demonstrates the proper procedure to remove a hydraulic shore from a trench.